(Phys.org) —Smartphone cameras are taking on advanced features as smartphone vendors continue to compete for sales. Toshiba last week announced a dual camera system that will be a talking point in mobile devices at some time in the future. Toshiba last Thursday announced a dual camera system "TCM9518MD" that brings deep focus imaging to smartphones. The camera will provide capabilities for deep focus and post-focus, in contrast with cameras where the picture taker needs to focus on objects before snapping, with no such second chance to make adjustments. The Toshiba camera system in mobile devices will enable manipulations to change the depth of field and point of focus. Toshiba's system uses two 1/4-inch 5Mpixel CMOS image sensors that are placed side-by-side, recording depth and images at the same time. Toshiba highlighted this in its product announcement, referring to the product's new "depth map" and "deep focus image" capabilities. "The TCM9518MD's twin cameras and dedicate companion LSI simultaneously deliver deep focus images in which foreground and background and all points in between are in focus, with depth data on each object in the image. This supports creation of new applications for smartphone, tablets and mobile devices, including refocus, defocus and extraction of any objects of the images, and gesture operation." Toshiba will start to ship samples of the module for smartphones and tablet computers in January next year, and the company intends to mass-produce the system in April next year at a rate of 500,000 units per month. In its statement, Toshiba noted that "Computational cameras create images impossible to realize with the standard camera module by combining optical hardware technology—the lens and diaphragm—with digital signal processing technology. 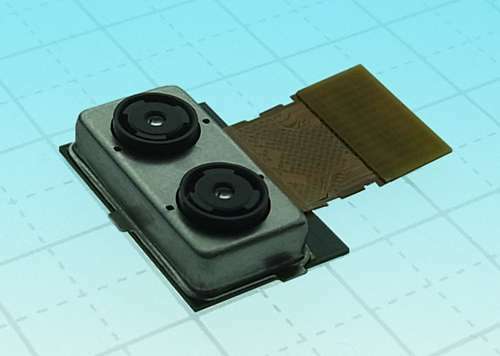 The TCM9518MD brings high resolution and computational camera functionalities to the CMOS image sensor market for smartphones, tablets and mobile devices." News sites carrying the announcement referred to the new module as a Lytro-like camera phone. They are talking about the Lytro camera, which Mountain View, California-based Lytro introduced in 2011. Lytro describes itself as the creator of the world's first consumer light field camera. The company said the camera's user and friends can "endlessly refocus pictures after you take them."